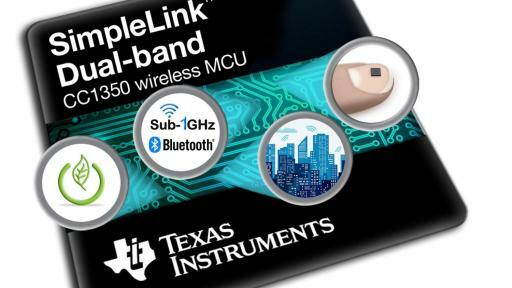 Expanding the functionality of Internet of Things (IoT) networks, Texas Instruments (TI) (NASDAQ: TXN) today announced availability for mass production of the industry’s lowest-power dual-band wireless microcontroller (MCU) supporting Sub-1 GHz and Bluetooth® low energy connectivity on a single chip. 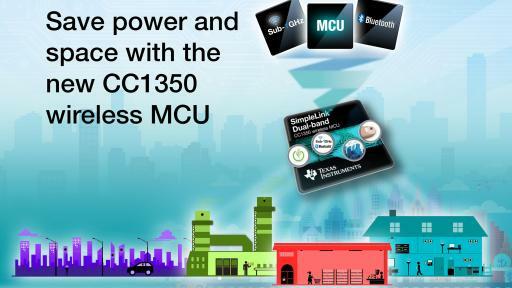 As part of TI’s pin-to-pin and software compatible SimpleLink™ ultra-low power platform, the new SimpleLink dual-band CC1350 wireless MCU enables developers to move from a three-chip solution to a tiny single chip, while reducing design complexity, saving power, cost and board space. The CC1350 wireless MCU offers a range of up to 20 km on a coin cell battery for building and factory automation, alarm and security, smart grid, asset tracking and wireless sensor network applications. For more information, visit www.ti.com/cc1350-pr. Tune into our virtual press conference today, September 14 at 9:00 a.m. CST on Facebook Live to learn more. Dual-band connectivity that expands the functionality of a Sub-1 GHz network with Bluetooth low energy implementations such as beaconing, over-the-air updates, smart commissioning, remote displays and more. Long-range connectivity paired with ultra-low power consumption that offers a sleep current of 0.7 uA which allows for more than 10 years of battery life. 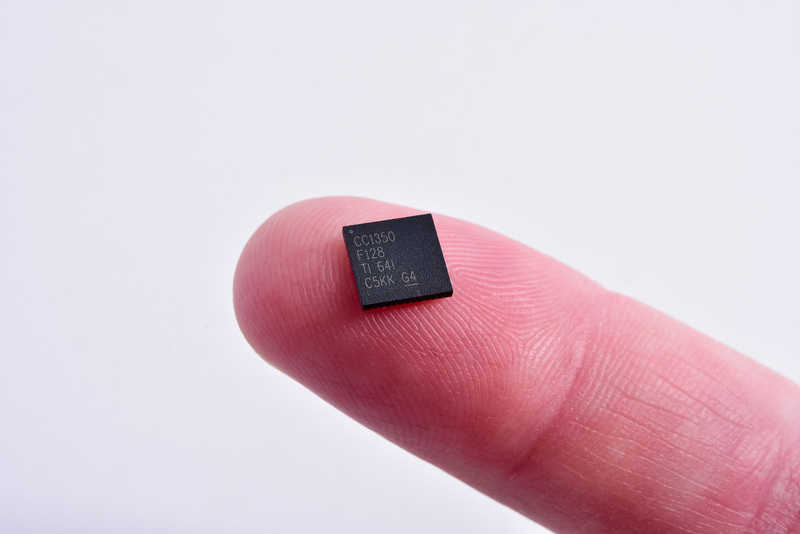 Enhanced integration in a tiny wireless MCU that combines a Sub-1 GHz transceiver and Bluetooth low energy radio, as well as an ARM® Cortex®-M3 core in a single, Flash-based, 4x4 mm QFN package. Developers can get started in minutes with the low-cost SimpleLink CC1350 wireless MCU LaunchPad™ development kit or connect sensors to the cloud in minutes with the SimpleLink CC1350 SensorTag demo kit supported by TI’s Code Composer Studio™ integrated development environment (IDE) and IAR Embedded WorkBench®. 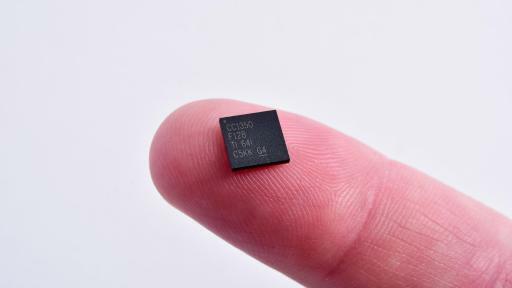 Additionally, TI has simplified development by providing multiple software options including point-to-point communication examples with EasyLink, a wireless M-Bus protocol stack leveraging TI RTOS, as well as the BLE-Stack 2.2 software development kit (SDK) which supports Bluetooth 4.2 specifications. Developers will also have access to online training and E2E™ community support to help ease their design process. 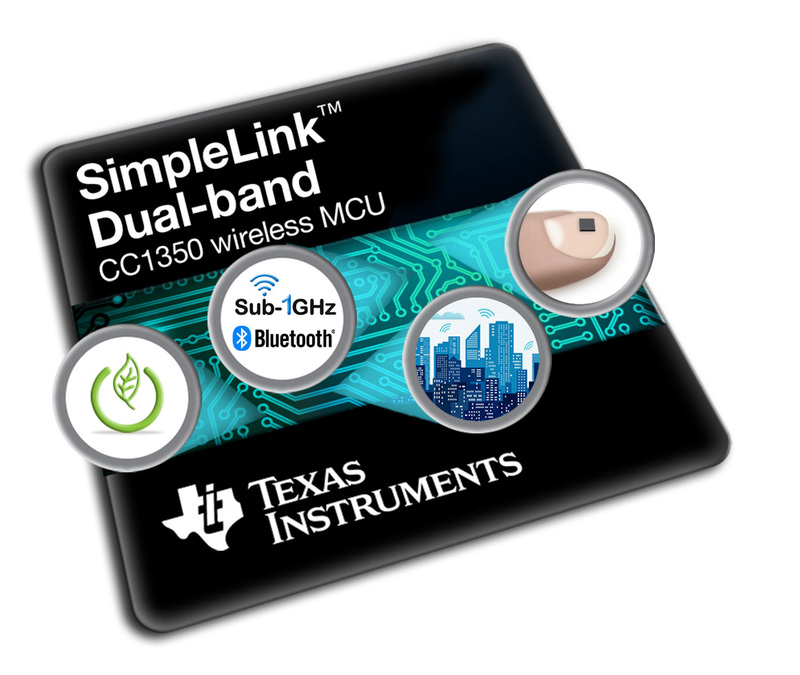 SimpleLink Sub-1 GHz CC1350 wireless MCU-based development kits are available now on the TI Store and through TI authorized distributors. CC1350 LaunchPad kit (LAUNCHXL-CC1350): USD $29.00 – develop a complete prototype with a low-cost Sub-1 GHz and Bluetooth low energy wireless MCU hardware, software and RF development platform. CC1350 SensorTag demo kit (CC1350STK) coming in 4Q 2016: $29.99 – demonstrate your Sub-1 GHz and Bluetooth low energy project with a small, sensor-based kit which includes 10 low-power MEMS sensors and can connect to the cloud in less than three minutes. Discover the benefits of TI’s ultra-low power wireless MCUs. Learn more about advantages of Sub-1 GHz and Bluetooth low energy in a single chip in thiswhite paper. 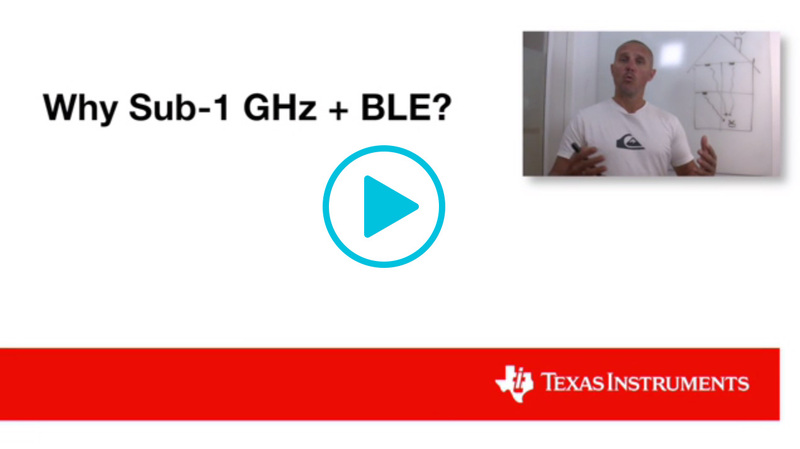 Watch the why Sub-1 GHz + Bluetooth low energy video. 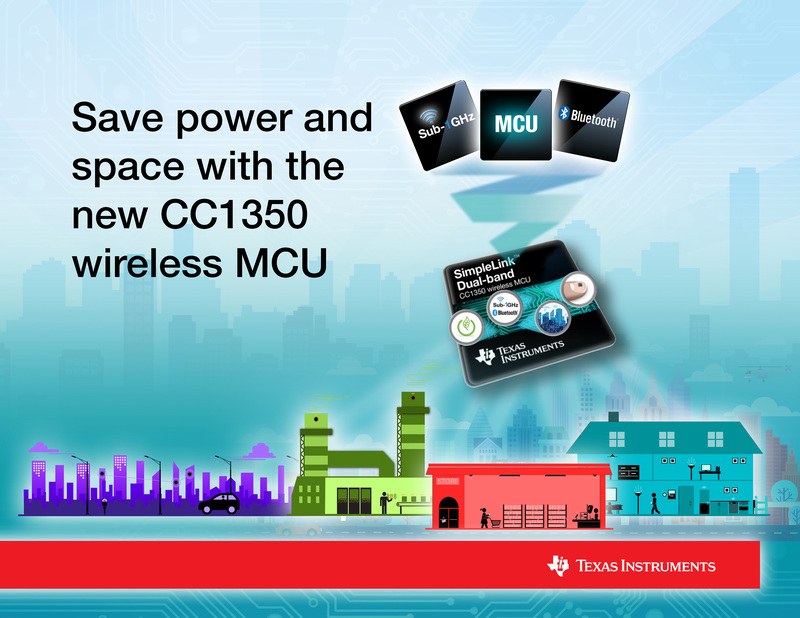 Read more about CC1350 wireless MCUs on the ConnecTIng Wirelessly blog. TI’s SimpleLink portfolio of low and ultra-low power wireless connectivity solutions – wireless MCUs and wireless network processors (WNPs) for the broad embedded market – makes it easier to develop and connect anything to the Internet of Things (IoT). Spanning over 14 standards and technologies including Bluetooth® Smart, Wi-Fi®, Sub-1 GHz, 6LoWPAN, Thread, ZigBee® and more, SimpleLink products help manufacturers easily add wireless connectivity to anything, to any design, for anyone. www.ti.com/simplelink. SimpleLink, Code Composer Studio and E2E community are trademarks of Texas Instruments. All other trademarks belong to their respective owners.